Sea-frozen fillets are a high-quality product that is filleted and frozen to -20 °C within hours of bringing the live, wriggling fish on board the fishing vessel. This produces fillets of unique freshness and quality. The catch process, production and freezing affect both the quality and the product characteristics of the fish. To guarantee good quality, it is important for there to be quality controls along the entire value chain. Through a joint initiative, the pro­ducers of Norwegian sea-frozen fillets have developed a Norwegian Standard, NS 9444 Fish and fish products - Norwe­gian fillet of white fish -frozen at sea - Quality requirements. This applies from the catching of the fish to the final unload­ing of the fillet. The purpose of this standard is to con­ tribute to the reliable high quality of Norwegian sea-frozen fillets of white fish, support marketing communication and simplify contract dratting and order preparation. The standard defines product characteristics for Norwegian sea-frozen fillets of white fish and will contribute to consistent documentation of its quality. The quality of the fillet is ensured through six control points in the production process. The vessels that produce Norwegian sea-frozen fillets shall be registered and approved bya national authority and have an approved own control system. The standard's requirements supplement applicable Norwegian acts and regulations concerning the onboard production of fish products on vessels. Users of the standard are longline vessels and trawlers producing Norwegian sea-frozen fillets, fish processors, and sellers and buyers of fish and fish prod­ucts. The standard has been published in both a Norwegian and an English version. The contact at Standards Norway for this area is Project Manager Rolf Duus, rdu@standard.no. Stocks fished by the Norwegian fleet are harvested sustainably. Cod, haddock and saithe are MSC-certified. 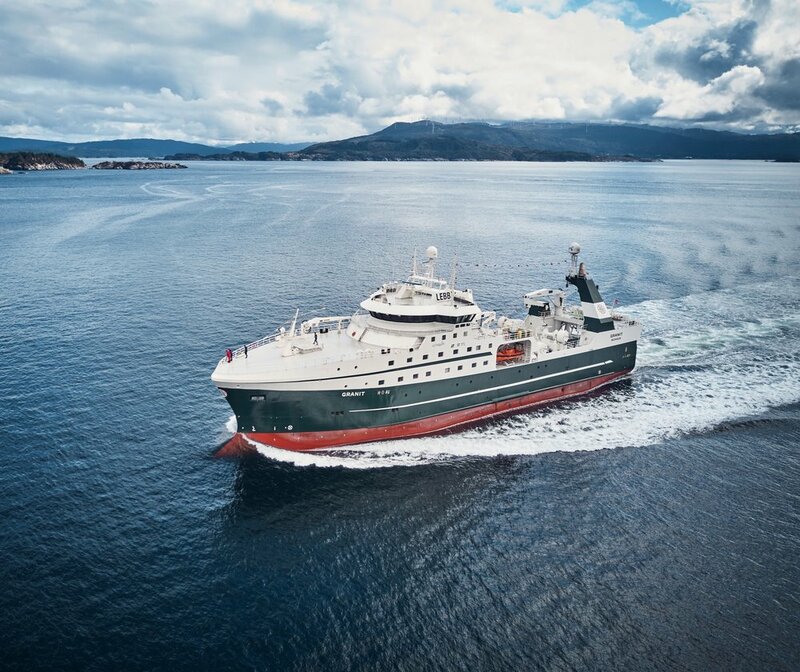 The Norwegian Factory Trawler Fleet and longliners are quality producers of fillets and headed/gutted products from Cod, Haddock and Saithe fished in the clean and cold waters of the Barents Sea, the Norwegian Sea and the North Sea. Cod and Haddock in the North, Saithe along the Norwegian Coast and in the North Sea. These vessels are in addition fishing smaller quantities of Redfish, Greenland Halibut and various other whitefish species. The fundamental principle for Norwegian management of living marine resources is the principle of sustainable use based on the best available scientific advice. All the target stocks of the factory trawler fleet are well placed in the “safe zone” by the International Council for the Exploration of the Seas (ICES), and subject to a fisheries pressure well within pre-determined precautionary harvest limits. Cod and haddock fisheries by the Norwegian factory trawler fleet and saithe fisheries targeting the North Sea stock and the North East Arctic stock are certified in accordance with the Marine Stewardship Councils (MSC) Principles and Criteria for Sustainable Fishing. On board production assures the highest quality standards as fillets are produced and quick frozen to below -20°C within a few hours after catching. The fleet’s product range varies from raw materials for further processing, like headed/gutted frozen fish, block products, to ready-to-eat interleaved fillets. All vessels are producing in accordance with Hazard Analysis Critical Control Point-systems (HACCP), and are approved by the Norwegian Food Safety Authority. Norwegian vessels are members of The Frozen at Sea Fillets Association (FASFA). The Norwegian Frozen at Sea Producers are owners of all Norwegian flagged vessels licensed to produce fillets of whitefish at sea, and their partners or handling agents in the export trade of these products. Information page from Fiskebåt and The Norwegian Seafood Council on the cod fishery in the Barents Sea and near Svalbard. In the UK there are more than 10.000 fish and chips shops. There is nothing more British than fish and chips – eaten with salt and vinegar, fish and chips is one of the Great British institutions. No one really knows where the famous culinary delight originate. We do know that fish and chips were developed separately. The French invented chips or “chipped pommes de terre a la mode”and in 1839 Charles Dickens referred to a “fried fish warehouse” in Oliver Twist. The great British fish and chip trade grew out of these existing small businesses which sold fish and chips separately in the streets and alleys of London and some of Britain’s industrial towns in the 1850’s. However the dish originated, fish and chips is a national favourite, eaten and loved by every generation – in fact its position as the nation’s favourite hot take away remains unchallenged, despite the advent of the American burger. In 1995, the British consumed an astonishing 300 million servings of fish and chips – that equates to six servings for every man woman and child in the country. The record for the largest number of portions sold in one day by an independent fish and chip shop is over 4 000. With more than 250 million fish and chip shop meals sold a year, the traditional dish of fish and chips is still top of the league of Britain's favourite fast foods. It is difficult to resist the tasty combination of fish and chips and fortunately there are around 10 500 fish and chip shops in the UK. Fish and chips from fish and chip shops are freshly prepared from natural products. Fillets of fish, mostly haddock or cod, but sometimes plaice and whiting are covered in batter, fried until golden and served with freshly chipped potatoes. Fish and chips are a wholesome dish and lower in calories than many of their fast food rivals. They have been recommended by doctors for pregnant women and were one of the only foods not to be rationed during the war. Historians even argue that fish and chips helped us to win the Second World War. Britain’s favourite accompaniment to fish and chips is salt and vinegar but depending on the region, others are just as popular mushy peas, tomato ketchup, curry sauce, gravy, or even a bottle of stout. Strange but true, the Chinese are so sweet on our fish and chips that they serve them with sugar. The first Norwegian factory trawler, Longva, was delivered to Longvatraal AS, Aalesund, in 1962. However, the history started many years earlier. The first Norwegian factory trawler, Longva, was delivered to Longvatraal AS, Aalesund, in 1962. Skipper John Longva, who fished off West-Greenland with the longliner Longva, had in 1954 been visiting the English factory trawler Fairtry I, when both vessels were in harbour in Greenland. Fairtry I was owned by the Salvesen company in Leith (Scotland). Fairtry I had many problems in the early period, especially in the production, but Longva registered that the concept: Fishing and processing on the same vessel, was the future. John Longva contacted the Liaaen yard in Aalesund, and together with Nils Liaaen and Reidar Sætremyr, both naval architects, they started designing the first Norwegian factory trawler. After many years with challenges to obtain financing, the newbuilding contract was signed between A.M. Liaaen AS and Longvatraal AS. Longva did also meet a number of problems in the beginning, but these were solved, and after a relatively short period Longva was a success. In the sixties there were built a few more factory trawlers for Norwegian owners. The Liaaen yard was the leading shipyard. Later owners in other countries, especially the Faroe Islands, ordered the same type of vessels. The building of Norwegian factory trawlers continued in the seventies and eighties. In the mid-eighties the outlook for the cod and haddock stocks in the Barents Sea was very good, and almost all the Norwegian factory trawlers were replaced by new buildings in the period 1985-89. In 1990 the fleet numbered 25 vessels. Even before all of them had been delivered from the yards, the stock situation had changed dramatically, and some of the trawlers had to be sold or chartered to other countries – the Argentines, Greenland and New Zealand - or rebuilt for offshore services. It is safe to say that the Norwegian factory trawler concept and technology has been a success story in many fishing nations, not least thanks to Norwegian ship designers, yards and key personnel (skippers, chief engineers, trawl bosuns and factory managers). Longliner Geir marked the starting point for line caught sea frozen fillet in 1983. The contrasts are enormous from the first wooden vessels built more than one hundred years ago to the top modern Norwegian longliners fishing today. In 1983, the fishing company H.P. Holmeset AS, decided to rebuild and extend their vessel Geir. This marked the starting point for line caught sea frozen fillet, and it didn´t take long time before other longliners followed in their path. The Norwegian longliners are designed with the very best equipment to ensure that the fish is treated in the best possible way from it´s caught alive, one by one by hook and line, until it´s frozen on board within three hours later. The quick freezing-process locks in the quality of the fish, which ensures a quality of the absolute highest standard. Today five longliners are producing premium fillets on board-fresh frozen at sea. The longliner, Atlantic, which is being delivered during 2019. The outlook for the resources in the Barents Sea is now very good, especially for cod and haddock. We have to go many decades back to find a similar stock situation. Together with first class products, the Norwegian longliners and factory trawlers will continue to be considerable suppliers of first class sea-frozen fillets to the international market. The Norwegian fishing fleet is committed to think environmentally friendly throughout the whole process. For the fleet it is important to reduce the use of energy. Therefore, hybrid technology comes in different ways. The longliner, Atlantic, which is being delivered during 2019, has used a comprehensive battery pack to reduce fuel consumption. Several vessels follow.